← Encephalon, the neuroscience blog carnival, is coming back! 2010 is an incredible year for science books, many written by people who daily write on blogs. The latest in this fantastic streak is Written In Stone (homepage, IndieBound, Amazon) by Brian Switek (blog, Twitter). Written In Stone is officially published today. If you pre-ordered it, it should hit your mailbox in a few days and bookstores should get it soon after (watch Brian’s blogs for updates – there was a small delay in shipping). I got the book earlier, have read it and loved it – my review is coming here later today. But first, I wanted to catch up with Brian and ask him a few questions about his book, his blog, and how the two are connected. A few years ago, you were a student and blogging was a hobby – something you did on the side, out of love. At what point did you realize that you could do writing as a profession? Was there a precipitating event or did that gradually dawn on you? There wasn’t any single event or cause – I just fell into it. Now that we’re mostly beyond the blogger vs. journalist sniping – I hope – I can look back and say that I was acting like a science writer even before it became a viable career option. Making the transition required a change in attitude and a realization that I could actually get paid for what I like to do, and I feel exceptionally lucky that I have been able to turn my hobby into a nascent science writing career (even though I still work an unrelated day job to keep the lights on at home). The more detailed story goes like this – After blogging for two years, I got serious about my science writing and started to pitch to magazines. My performance was abysmal. Most of the time I didn’t even hear back from the publications I pitched to. Still, I kept using my blog as a writing laboratory and tried to fine-tune my writing. Then, in May of last year, everything changed almost instantaneously. It was at that time that I started working with my literary agent – Peter Tallack of the Science Factory – and Mark Henderson of the Times was kind enough to give me my first formal op-ed about the Darwinius controversy. Those breakthroughs, paired with the earlier acceptance of my first academic paper (just published), allowed me to build up enough momentum to start making some headway into more formal channels of science writing outside the blogohedron. I wouldn’t be able to do what I do without blogs, Twitter, or the web in general. Blogging allowed me to practice writing, plug into a community of fellow science enthusiasts, and has otherwise made it possible for me to become a professional – if still part-time – science writer. If I tried to do the same thing just a few years ago, or otherwise tried to jump into science writing without developing my writing online, I would have almost surely failed. As I mentioned above, though, I did not think of my efforts as a career change. The only major difference was that people started paying me for the sort of work I had been doing anyway! How did you decide to write a book? You were already a well-known blogger and have started appearing in more mainstream media on occasion – why a book? Written in Stone had a relatively long gestation and significantly changed since the time that I was first inspired to write a book. I knew that I wanted to write a book about evolution from the time I started blogging, but I was pretty clueless as to how to go about it. I used my blog as a way to practice writing, keep up with the literature, and organize my ideas. Blogging gave me an incentive to keep learning, researching, and sharing that information with whoever cared to read it. This went on for about three years. I kept notes and wrote parts of a few chapters, but I didn’t have a story to tie things all together. I knew that I wanted to write about evolution from the perspective of the fossil record, but that’s not a book – I needed a more specific angle from which to approach the bigger story of life through time. I knew that I didn’t want to write a comprehensive textbook – we’ve already got plenty of those – but what examples should I choose to help people understand what fossils tell us about how life has changed? Unfortunately I can’t remember the moment the idea struck me, but I settled on looking at some of the major transitions in the history of vertebrates that transfixed me as a child. The evolution of the first tetrapods from fish, the evolution of birds from dinosaurs, the evolution of whales from terrestrial mammals, the evolution of humans, and others – they were classic examples of evolutionary change, but as I became more familiar with the scientific literature I felt that the public wasn’t being presented with the latest science about these examples. Even in recent popular books about evolution, a few of these transitions would be presented but usually in such paltry detail as to be unconvincing to anyone who didn’t already agree that evolution is a reality. More than that, these changes have been debated for a very long time but we often talk about them only in reference to recent discoveries. I wanted to dig into the long history of debate and show how our understanding has changed. In distilling everything down to simple, step-by-step diagrams of evolutionary change, I felt like other authors had missed something, and I wanted to plug that gap in the popular literature. Once I figured all that out, writing the book wasn’t too difficult. I had been rummaging through the literature for my own education for several years already – it was mostly a matter of writing the thing. With three chapters in hand, I signed with Bellevue Literary Press in September and completed the first full draft of the manuscript just two days before Christmas. The manuscript went back and forth a few times over the following months for edits, but, looking back, I am still a little baffled as to how I put the whole thing together so quickly! 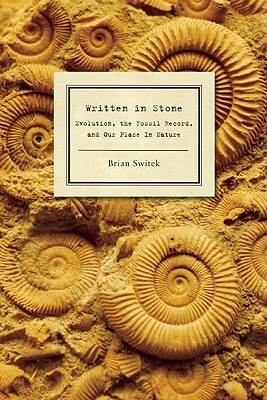 Your writing – both on the blog and in the book – looks at evolution, focusing mainly on fossils, in the context of history of science. This is a pretty unique combination of themes – where did that come from? Was that a conscious decision or something that just happened as it combined your existing passions? The mix of evolution, paleontology, and the history of science happened organically. They all overlap and feed into each other. Since I wanted to write about what the fossil record tells us about evolution, those aspects of the story came together very easily. I could have left it at that, but then I would have done the same thing as everyone else by divorcing recent discoveries from their context. I didn’t want to do that. I did not want to act as a figure of authority, handing down data for the public to digest and accept. Instead of taking the more traditional approach, I wanted to give the book a warmer tone – I wanted to present science in the way that I might talk to a curious friend about evolution, or in terms of what I might say if I were walking with someone through a natural history museum. The history of science allowed me to do this by providing me with a flowing narrative which encompassed the scientific points I wanted to talk about. This served the dual purpose of placing recent discoveries in context and also gave me a way to lead readers through the tangled process of scientific discovery. This was especially important in the historical chapters about the beginnings of paleontology and evolutionary theory (Ch. 2 and 3). I found the idea of simply laying out the nuts and bolts of stratigraphy, natural selection, the nature of the fossil record, etc. repulsive – as I mentioned, I had no intention of writing a textbook – but by tracing the history of science I could use stories to introduce readers to those same concepts in a more palatable way. Naturally, my own interests played a role, as well. I am fascinated by vertebrate paleontology, and both evolutionary theory and the history of science remain important in the field for understanding the patterns of life on earth and how our perspective of those patterns has changed. It was not a stretch to bring it all together. Paleontology is an evolutionary science, and paleontologists are constantly reexamining old specimens and localities. Given all these available perspectives, it was mostly a matter of choosing where to place the emphasis. The book grew out of your blog. What proportion of the book, can you estimate, comes directly from edits of your older posts, and how much was brand new material? Was it difficult to repurpose the bloggy format into something that will work well in the book form? The book grew out of my blog in the sense that I used my blog to practice writing about some studies and ideas which eventually became incorporated into the blog. The book is not just a stitched-together collection of posts. It was written as a story unto itself – containing many smaller stories – and even when I covered something I had blogged about earlier I disregarded what I had already said and wrote something fresh. Sometimes I would dig back into my posts for something I had referenced which I had trouble remembering, but in no instance did I edit any of my posts to place that material in the book. I wanted to write in such a way that the story flowed, and I felt that if I was going to start incorporating material directly plucked from the blog I would jeopardize that. Readers of my blogs will see some familiar subjects, absolutely, but, barring quotations, the book is 100% new writing. Reading the book, it struck me how unique it is and how much it fills a glaring gap in the literature. There are many books on evolution. There are many books on the history of science. There are many books about fossils (though usually narrower in subject, focusing on a single group like dinosaurs, or even a single fossil like Tiktaalik or Darwinius). Yet I cannot remember another book that combines these three topics until today (literally today!). While it is fortunate for you that this niche was wide open for you to fill, do you have any thoughts as to why this niche was empty to begin with? Aren’t there other scholars who could have, perhaps should have, covered this area in this way? I think some historians of science have written similar books, but they have usually been focused on a particular time period of group of researchers (such as Adrian Desmond’s Archetypes and Ancestors about Victorian paleontology, Peter Bowler’s Life’s Splendid Drama about early 20th-century paleontology, or Eric Buffetaut’s sadly out-of-print A Short History of Vertebrate Paleontology). When you’re dealing with the history of paleontology, you have to include biological details as well as historical ones, and in many ways this historical subgenre was very influential in determining how I should go about telling my story. You’re absolutely right about the gap in the literature, though. I intentionally wrote this book to fill it. There’s no single reason why the gap was left open to start with. From a practical perspective, the history of science is often left out of popular books because there is a common assumption that the public doesn’t care about it. One publisher I spoke to about the book early on, in fact, wanted me to cut all the historical material from the book and focus only on new discoveries – from science magazines to book publishers, there is a major push to cover what is new and exciting and leave the historical bits for people who want to track them down (despite the success of some books, such as Bill Bryson’s A Short History of Nearly Everything, which have a heavy emphasis on history!). An exception is Sean B. Carroll’s recent book Remarkable Creatures, but, while I greatly enjoyed it, the treatment of significant people and specimens was a collection of snapshots which did not illustrate the importance of paleontology to our understanding of evolution. There are gaps and jumps in my narrative too – if I included everything I wanted Written in Stone would have rivaled The Structure of Evolutionary Theory in length – but it was very important to me to trace ideas through multiple shifts in understanding over the past 150 years. The fact that many recent, popular-audience books about evolution – such as Why Evolution is True by Jerry Coyne, The Greatest Show on Earth by Richard Dawkins, and Only a Theory by Kenneth Miller – have been written by lab-based evolutionary scientists is another reason for the persistence of the “paleo gap.” Paleontology isn’t their field and so, understandably, doesn’t get much attention from these authors outside of transitional forms in the fossil record. More than that, though, there is something of a conceit that genetics and microbiology are more important to evolutionary science than paleontology is. Paleontology is still often viewed as the search for old bones to fill museums with – it can demonstrate the reality of evolution by do little else. This appraisal of paleontology has been around since the beginning of the 20th century, at least, and Dawkins even downplayed the importance of the fossil record to understanding evolution in his book The Ancestor’s Tale. Since Stephen Jay Gould died in 2002, we haven’t really had a strong public advocate for paleontology as an essential evolutionary science. I’m no Gould, but I was inspired by his work to communicate the relevance of the fossil record to understanding of evolution (as well as similar efforts made before him by George Gaylord Simpson). Not only does paleontology provide the essential context to understand why life is as it is now – it is the science which showed us that extinction is real and that life has been changing for vast periods of time – but has become arguably the most interdisciplinary evolutionary science. 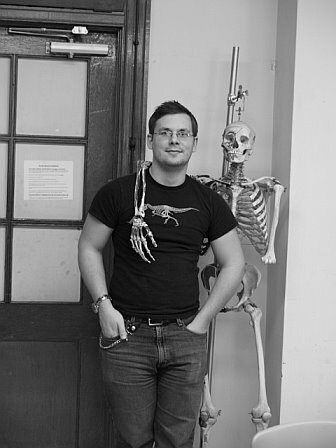 Paleontologists regularly use ideas and techniques from genetics, molecular biology, embryology, histology, geochemistry, and other sciences in addition to comparative anatomy and geology. Having just attended the 70th annual meeting of the Society of Vertebrate Paleontology just last month, I can tell you that paleontology is an exceptionally vibrant field in which everything from the color of dinosaur feathers to the tempo and mode of evolutionary change are being investigated. This makes the rather brief treatment of paleontology in many recent books on evolution all the more irritating – paleontology, as I know it, is not being reflected in discussions about evolution, and I wanted to write a book to help remedy that. One thing that struck me as I was reading the book is how well fleshed are the characters in the story, people like Lamarck, Darwin, Owen and Huxley, among others. You present them with a nuance that is rarely seen in usual discourse on the history of evolution. How much did you use biographies of these people, their letters and diaries, in trying to understand them as complex personalities, not just cardboard caricatures that we usually see? I have to admit that I actually did not get to include the amount of detail I wanted – I mostly restricted biographical sections to the period a given authority was working on a particular problem or idea – but I thought it was essential to provide some background as to who these people were and why they did what they did. In the case of Lamarck, for example, I didn’t know anything about his life outside of his ideas about evolution before writing the book, so I thought including a little more information about him would be a small way of helping his public image since he is so often trotted out to be a contrast to Darwin and nothing else. The sources I used varied from figure to figure. For Cuvier, I relied on various historical papers and Martin Rudwick’s selected translations of his work in Georges Cuvier, Fossil Bones, and Geological Catastrophes, whereas I used Adrian Desmond’s biography Huxley and the naturalist’s original research papers for sections about the man famously called “Darwin’s Bulldog.” The most difficult challenge was Charles Darwin. So much has been written about him that I could not possibly read it all, so in addition to biographical accounts I used the Darwin Correspondence Project and The Complete Work of Charles Darwin Online to dig into his original writings as much as possible. Of course my account of Darwin’s work is framed in terms of paleontology – I could not comprehensively cover everything he did, especially since he was such a prolific naturalist and correspondent! – but I tried to hit the major points of his career leading up to 1859 without derailing the paleontological thread of the book. Finally – what’s next? I know you will be busy traveling the country promoting the book, but I am wondering if you already have the ideas for the next book? I actually don’t have many travel plans. I’ll be giving a few talks in the NY-NJ-PA area, but I don’t have the budget to allow for a full-scale book tour. I am going to focus on doing what I do best – keeping up my blogs and trying to find more stories to tell in more formal science publications and journals. If opportunities to travel and talk about the book pop up, I’ll jump, but I have no idea when or where such opportunities will arise. If anything, I have too many ideas for future books. Some are just the seeds of future projects which will require significantly more background than I presently have to cultivate, whereas others I am already in the process of starting. Right now I am trying to choose between two different projects – one on the “Dinosaur Enlightenment” which is rapidly changing our understanding of the charismatic creatures, and another on the controversial idea of “Pleistocene Rewilding.” I fully intend on writing both, but which comes first depends on an array of factors from my ability to travel to places relevant to the books to the willingness of publishers to jump at the projects. Beyond those, I have at least three more ideas for long-term book projects on three disparate subjects, so with any luck I will be writing for some time to come! And, as a closing note, thank you for your help and support, Bora. You have been behind my writing from the very beginning, and it has been a pleasure to talk to you about a book which has grown directly from my work online. Your ongoing encouragement has helped drive me to become a more professional science writer, so I am genuinely thrilled that you enjoyed the book. Thank you so much for the interview. And let’s hope that book sells very well – it surely deserves it. This entry was posted in Blogging, Books, Evolution, History of Science, Paleontology. Bookmark the permalink. Great interview! I have always appreciated Brian’s writing and I look forward to getting his book when it reaches the book shelves.